Buford Betty: Swap till you drop! Love it!! Can't wait to come to the Fall swap! It looks awesome!!! 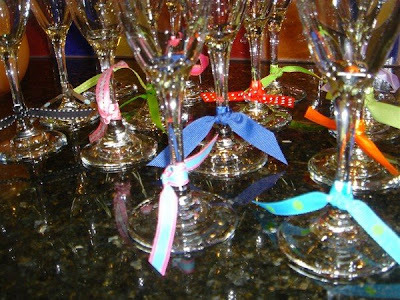 What a great idea :) I especially loved your ribbon idea with the champagne flutes! Thanks for sharing. That is an amazing idea! What a great way to get rid of older, and still nice stuff! I am excited for you! And so glad to hear that it was so successful! I am going to pitch the idea to some of my girlfriends! Thanks for all the details and suggestions. I'll be sure to let you know if we decide to do one! What fun!!!! I think you may have inspired me to try this! Yippee, a fun new way to get together. And, hey, your house is so cute! 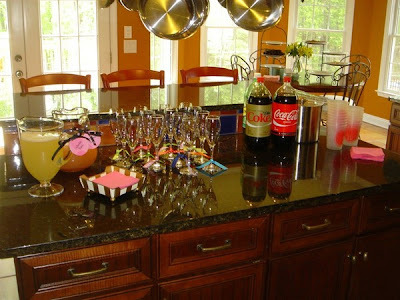 Along with the decorations! You are an amazing hostess! I LOVE that cute purse with the tulips - you are just too much! Anyway, I'm so sorry I couldn't make it - April has just been a crazy month. I hope to make the next one!! I LOVE this idea. Would you share with me what you said on your evite. Also, was it an even swap - bring 5 items, take 5 items? I'd be worried that someone would be a clothes hog. How did you plan on handling fighting over items? 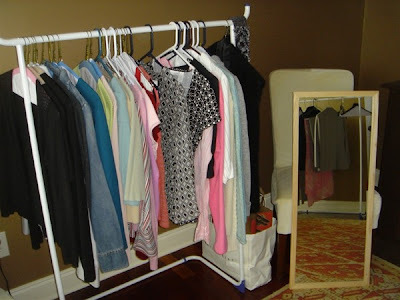 Also, did you have a guest room serving as a dressing room to try on items? Jennifer - I'd be glad to send you the evite wording. Email me at aaz106@yahoo.com and I'll be glad to forward it. There were no rules as far as it being an "even" swap. There's no real way to monitor that, but I wasn't really concerned about that happening since these girls were friends. Everyone brought a ton of stuff and I think they were just as thrilled to get rid of old stuff as they were to get some new things! No one fought over anything but I suggested having a "walk-off" if two girls were going after the same piece. 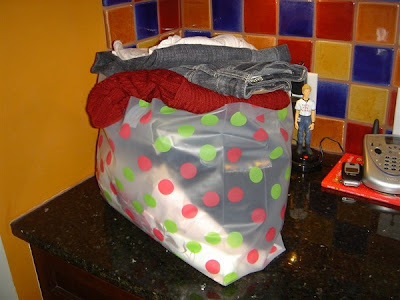 But there was so much stuff - it wasn't even necessary. I did have a spare bedroom available to change in as well as a couple of bathrooms. But most of us just threw things on and off in the middle of the madness! I wore a dress - makes trying on pants and skirts so easy. What a great idea and it sounds like so much fun! I'd love to be able to do this with my gal pals! This seems like such a great idea! And what a wonderful job you did hosting it! I love the little ribbons tied around the stemware. I bet your friends had a blast! Thanks for your comment & dress advice on my blog! I really appreciate the help! 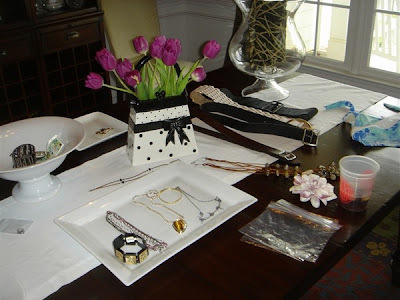 I love your blog and I want to sit and read it all when I have the time.. and I am definitely "borrowing" the ribbon around the stemware idea for a Mother's Day brunch I am having next week!